Recommended to: Readers who enjoy retellings of classic stories and are okay with a little oddness! When I first laid eyes on the loveliness that is A.G. Howard's Splintered, I knew that it would be in my reading pile. I am an avid fan of retellings of fairy tales and classic stories! Especially when they put a twist on what has already been written. I opened this book looking for something unique. Something new. I couldn't wait to be swept away into a new version of Alice's story. My initial reaction was one of pure delight. Alyssa Gardner is a wonderful main character, and you can easily see the thin line she walks between her supposed madness and reality. I adored the way that A.G. Howard so easily built a background for Alyssa's family, and tied it into the original story. When the time finally came for her to descend into Wonderland I was sitting on the edge of my seat. What would she find there? Would it be the same? Different? Unique? Lucky for me, it was everything I was hoping for. Howard builds a Wonderland that is dark, vicious and deceptive. Madness rules the day here, and the more that Alyssa allows herself to succumb to it, the easier things get for her. I couldn't stop myself from making a slight comparison here and there to the American McGee world, but the twisted creatures in this story are in a category all their own. I was totally immersed in the world built for me, and I didn't want to surface. My love ended rather abruptly though, as soon as the love triangle came into play. I'll be the first to admit that it drove me completely mad. Essentially Alyssa is given the choice between two men who are both just terrible for her. One who treats her like a child, and the other who is a manipulative creep. For a long while I admired and loved Alyssa's tenacity and intelligence. However once these two came into the picture together? She totally changed. It was maddening. Sadly, I almost didn't finish the book. Although I can say I'm glad I did. As you can see my thoughts on this book were rather split! 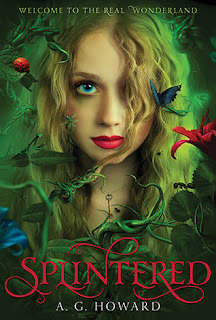 Or Splintered perhaps? Ha. Sorry about the pun. Anyway I could go on and on about how I felt, but I really think this is a book that you need to experience for yourself. The beginning held a ton of promise, and I know that I'd happily read anything else that A.G. Howard puts out in the future. Perhaps this wasn't my favorite read of the year, but I did enjoy it! I recommend you give it a shot.